Following the story of the main stand from inception to its current redevelopment, the 1892 tiptoes between Anfield's rich heritage and our Club’s international future. Welcome to premium hospitality that shares a real love of football. Welcome to premium hospitality that shares a real love of football. 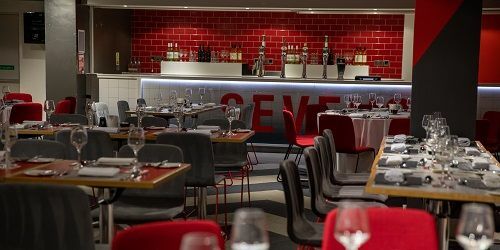 Offering a delicious set-menu of modern British food, complemented by attentive service, pitch views and a vibrant pre-match atmosphere. Lounges with a lively and warm atmosphere. The Dugout celebrates Liverpool FC's creativity on the pitch, whisking fans from the terraces to the side-lines for some of our club's most iconic moments.